Horses for Healing began in 1997 when two friends, Norma Harris and Judy Gerhard, got together to try and help Norma’s sister, who had multiple sclerosis (MS). Judy was a teacher and horsewoman who trained and taught both horses and riders. Norma had read an article about the benefits of horseback riding for people with MS. Their simple experiment to help Norma’s sister was so effective that word got around and soon other people with MS and other disabilities wanted to benefit from this wonderful new therapy too. That was the birth of Horses for Healing Therapeutic Riding Program. At the time, it was the only such program that was open to adults. 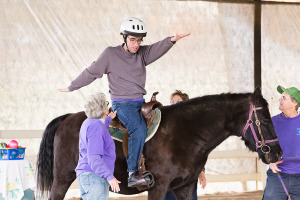 Now Horses for Healing serves both children and adults with special needs including physical disabilities, cognitive and emotional challenges arising from a variety of causes. We are located in Auburn, California and draw riders from the surrounding communities of Nevada, Placer and Sacramento counties.